The hippopotamus, a semiaquatic mammal native to Africa, eats mostly grasses and other vegetation, but occasionally scavenges for meat. The hippo uses its molars, located in the back of the mouth, to grind these foods. The molars are crucial to consuming the diet; a hippo whose molars are too worn will starve. Hippos have the same four types of teeth as humans: incisors, canines, premolars and molars. 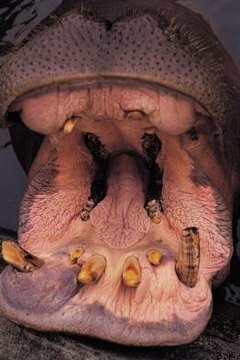 The adult hippo has between 38 and 42 teeth, most of which -- 28 -- are premolars and molars found at the sides and back. In front, hippos have sharp incisor teeth and canine tusks that are used for defensive biting and for making aggressive displays. Premolars and molars are flat-ridged teeth used for chewing and grinding food, just as humans’ premolars and molars are. Molars and premolars are essential to hippos’ ability to consume food, and quite a lot of it -- they eat over 50 pounds a day. Hippos are herbivores, they they have been observed scavenging on carcasses during times of drought. Hippos primarily graze on grass, fruit and other vegetation, grabbing it with their lips and moving it to their molars for chewing. They grind the food with the flat surfaces of the molars, mashing it until it can be swallowed. Incisors and canines grow throughout a hippopotamus’s life; the canine tusks can reach 3 feet in length. However, premolars and molars do not grow continually. Like humans’ teeth, molars and premolars are susceptible to wear from grinding even though they are covered with enamel for protection. When these teeth become too worn, a hippo can no longer chew and so cannot eat, and will die of starvation. Hunting is one of several threats to hippopotamus species; their meat, skin and teeth are prized by hunters. Hippos’ molars are not valuable to hunters, but their incisors and canines are, as ivory rests under layers of enamel and dentin. Hippopotamus ivory is denser than elephant ivory and less susceptible to decay, increasing its appeal. Conservation efforts are underway to protect hippos from hunting and other threats to their native habitat. What Kind of Grass Do Zebras Eat? How Are the Gecko's Teeth Adapted to What It Eats? Which Teeth Do Rats Use for Gnawing? What Kind of Teeth Do Walruses Have? Do All Bats Have Fangs? What Desert Animals Are Heterotrophs? What Are the Functions of a Rumen? Do Lemurs Have Two Tongues?